Infiniti FX Forum : FX35, FX45 and FX50 Forums > Electrical > Audio / Video / Navigation / Electronics > Mediabridge install: Where are battery, ground and accessory wires? Mediabridge install: Where are battery, ground and accessory wires? I'm trying to ID the Batt (+12V from battery), ACC (switched 12V for accessory) & GND (car ground) wires on the radio's main harness. I have a mediabridge that I'm going to install on my '06 FX35. I've researched online for hours and finally came to understand that Nissan/Infiniti has a propietary 10-pin connector. 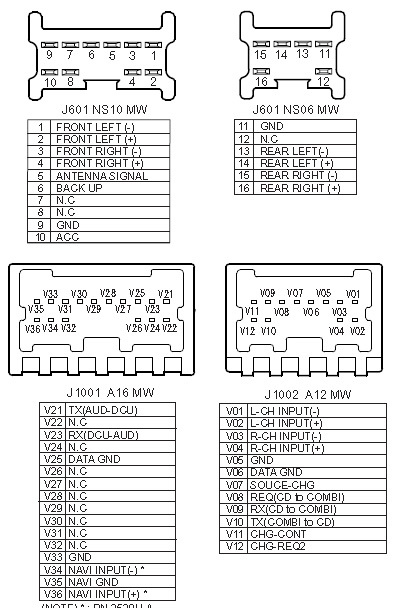 I've looked at several of the pinouts for this same connector and consistently the assignments for Batt, GND & ACC are pins 6, 9 & 10. Here is the location for the main harness (or rather power supply and front outputs) and where this 10 pin connector plugs into. When I connected my multimeter to pins 6& 9 on the connector I got 0 volts. I turned on my ignition just to make sure and still got no volts. I tried doing the same with the switched ignition (ACC) & GND, pins 9&10 and got the same results - 0 volts even when switching the ignition on & off. What gives? Not sure what I'm doing wrong, but can anyone tell me where I can get power, ground and switched voltage in this are of the car?